To say that Women & Children First is just an independent bookstore is only the beginning of the story. 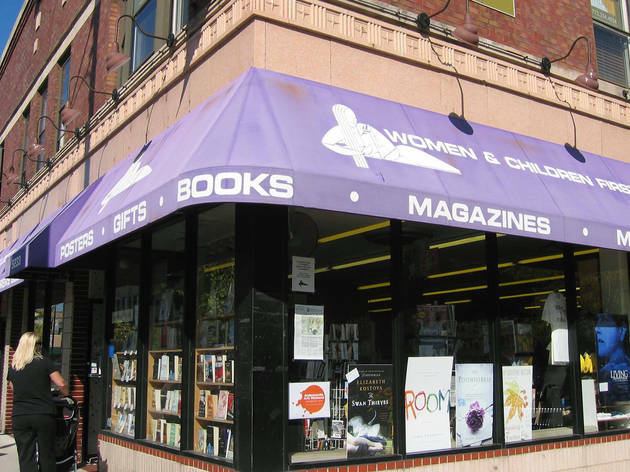 Opened in Chicago in 1979, the store will celebrate 40 years next year and has maintained its place as one of the largest and well-known feminist bookstores in the country. More than its wide selection of children’s books, literary journals and zines, and LGBTQ fiction and nonfiction, it serves as an inclusive space and haven for the community. In 2014, the store’s founders and owners, Ann Christophersen and Linda Bubon, sold the business to two of their employees, Lynn Mooney and Sarah Hollenbeck. The transition kept the store in strong hands as it continues its success and role in the community. Given such a reputation, it’s not surprising that Women & Children First has a long history of running book groups. At current count they offer seven active monthly groups with a range of themes: Social Justice, Feminist Book Group, Women’s Book Group, Family of Women, Classics of Women’s Literature, Teens First, and Women Aging with Wisdom and Grace. All groups are free and open to the public. Reading Group Choices reached out to two of the group leaders for a closer look at their history, memorable moments, and—of course—what they recommend! Group Facilitator: Mack Oliver, a teaching artist with the Chicago Public Schools and longtime employee of W&CF as their Coordinator of Fun. Reading Group Choices: We’ve heard that this group began after the members of the Kids First group grew up! When did the teen group begin, and how does it work? Mack Oliver: The Kids First Book Group was founded in September of 2012. It was originally for ages 8-12, and was supposed to stay that way. But after upping the age range several times to accommodate our oldest reader, Eli, we decided to transition the name to Teens First Book Group. Our core group have all been dedicated members all six years. The kids have always chosen all the books via vote, and there was an infamous 18-month period when we read absolutely nothing but middle grade novels about some child being a “chosen one” and then going on some quest to vanquish some evil adult. We reference that period all the time: “Remember when we only read about dragons? My god.” Now we read far more broadly: we just finished Ready Player One, and are about to start a graphic memoir about being a teenager in Turkey. Go Ask Alice really scarred us this spring! RGC: Do any memorable sessions stand out? MO: The time they spontaneously changed their names as a means of pranking a new kid! They were about 10-12 years old, and it was as if they suddenly became a very smug and cohesive improv troupe. I still call one of our readers Shanahan when he’s being lippy. And when they read Harriet the Spy our first year: they thought it was incredibly inappropriate that the book said “damn” and discussed that for perhaps half the session. Also our Five Year Anniversary Hoopla Extravaganza last year: after 60 books, we have a mountain of references and inside jokes, and it was so fun and meaningful to celebrate how far we’ve come. RGC: What in your view is the key difference (if there is one) to discussing books with a group of teens versus adults? MO: It’s so anecdotal. They’re forever making connections to school, to their home lives. The kids’ rapid evolution obviously isn’t something you’re going to see from adults either. We started with people who saw everything in the starkest and simplest of terms, and now I’ve got these people with the beginnings of political identities, pretty broad senses of humors, and much wider frames of reference. RGC: Please share any recent selections that your group found engaging! MO: The first book we ever agreed on was This Monstrous Thing by Makenzi Lee. It’s a queer-inclusive, steampunk story adjacent to Frankenstein, but not quite a reimagining of that story itself. I made my kids write the author fan mail because it seemed likely we would never unanimously love a book again. Group Facilitator: Linda Bubon, founder and original owner of Women & Children First with Ann Christophersen. RGC: Can you talk about the history of the Women’s Book Group, and how it works? Linda Bubon: There are seven or eight book groups that meet at the store, but the Women’s Book Group is the oldest, and from 1988 to the late 90’s was the only one. We meet on the third Tuesday evening of every month and discuss a variety of literature, exclusively by women. (We have made a few exceptions over the years). In December, we have a potluck and meet to suggest books for the following year—2-4 suggestions per person —and then vote for the 11 we most want to discuss. I assign the order, but we always include appropriate titles for Black History Month, Women’s History Month, and Poetry Month. Typically, 8-15 women come each month, but we’ve had some big turnouts (30-50) for Jane Eyre, Eleanor Roosevelt, Vol. 1, Backlash, and Gilead. RGC: Can you share any thoughts about what you decide to read? LB: Because the five or six members of the core group (we’ve had lots of newcomers and still do) are white women who want to educate ourselves, we’ve also been reading some of the new nonfiction that focuses on the lives of people of color: The New Jim Crow, The Warmth of Other Suns, Negroland, and The South Side were stand-outs. We often comment that it’s only because a book was required for book group that we read it—particularly long nonfiction—and were richly rewarded. Certainly true for Far From the Tree, The Warmth of Other Suns, and Crusader for Justice: A Biography of Ida B Wells. RGC: What in your view is the key to a successful or satisfying book group meeting? LB: I’m proud of gently leading this group for nearly 30 years. I suggested from the beginning that our format would be to go around the circle, each introduce ourselves and speak—without interruption—for a few minutes about our reaction to the book. When all voices have been heard, we embark on the discussion. We’ve been known to get into some great arguments, and while I insist on mutual respect, I don’t expect us to agree. Despite the best of reviews, no one is afraid to say, “I just didn’t like it. Maybe you can convince me otherwise.” And that sometimes leads to the most lively discussions. Please share any recent selections that your group found engaging! LB: Recent favorites that have produced good discussions include Pachinko, Hunger, Homegoing, Manhattan Beach, and Disoriental. View a complete list of book groups at Women & Children First (including their current selections) here.